After the busy weekend with plenty of good wine and food, my conscience was recommending at least a few days of penitence with light food and no wine. Unfortunately it wasn’t meant to be. Visiting the local Mega Image supermarket shopping for the usual groceries and waiting in the queue to reach the cashier, I stumble upon some good friends, Cristina and Dan, a couple that moved recently in the neighborhood. I guess MON is a common day to shop for food and replace the depleted reserves after the weekend for everybody. We haven’t seen each other for some time so we shortly decided to have dinner together at their place. I offered to bring at least the wine, and they gladly accepted. 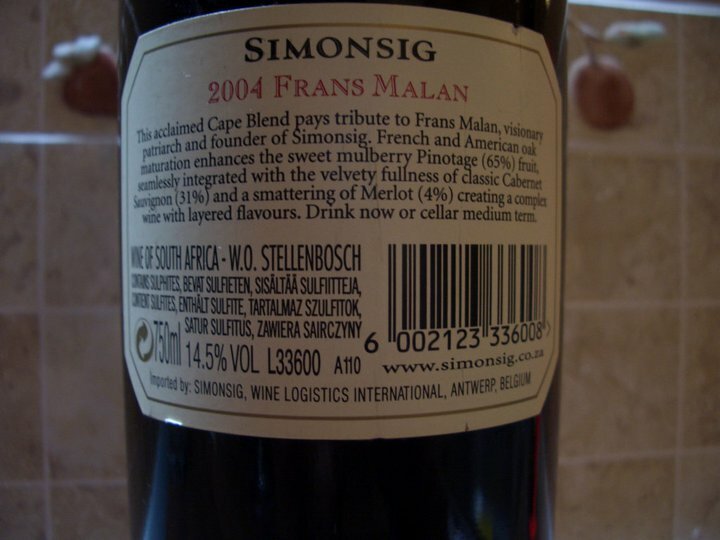 I went home and picked a South African wine that I bought in 2008 and stored in my cellar ever since. I never tried this wine before so I was very curious about it. I uncorked the bottle and took a sip just to make sure that I do not bring a corked wine to our dinner. Even from the first sip, I was really impressed by this wine. 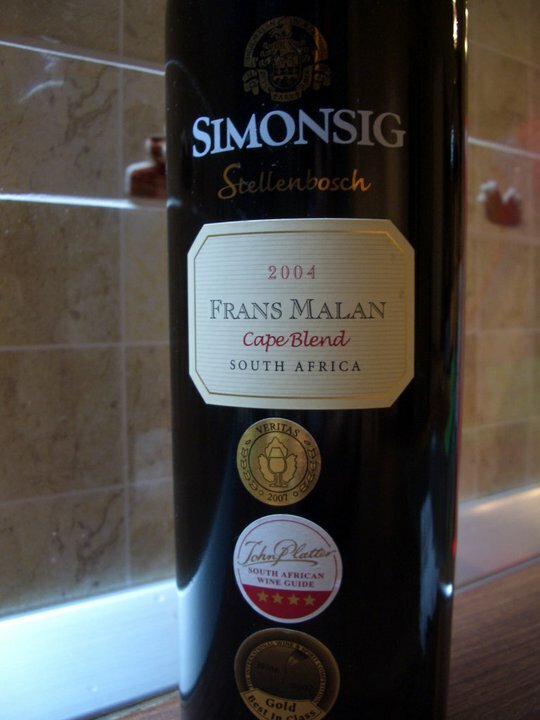 Blend of 65% Pinotage, 31% Cabernet Sauvignon and 4% Merlot aged in French and American oak. 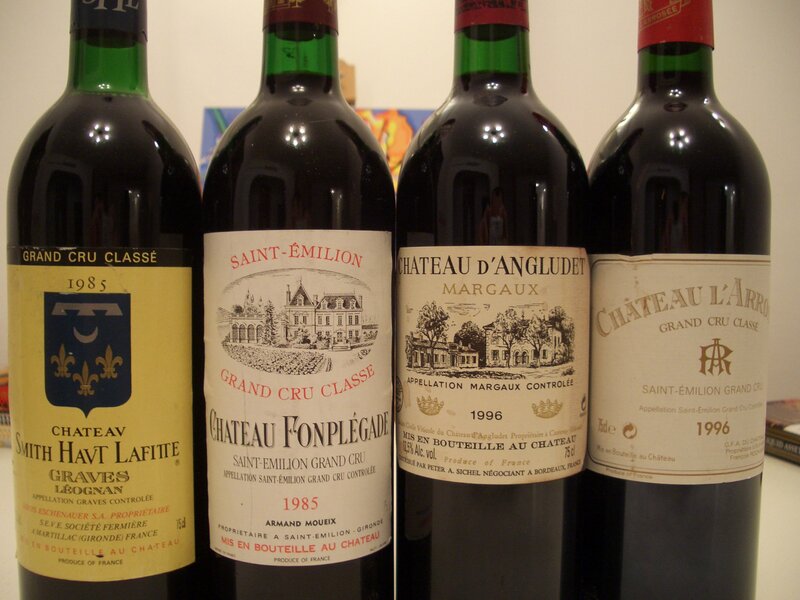 The wine won many prices as the several awarding labels from the front of the bottle show. Our hosts liked the wine a lot. 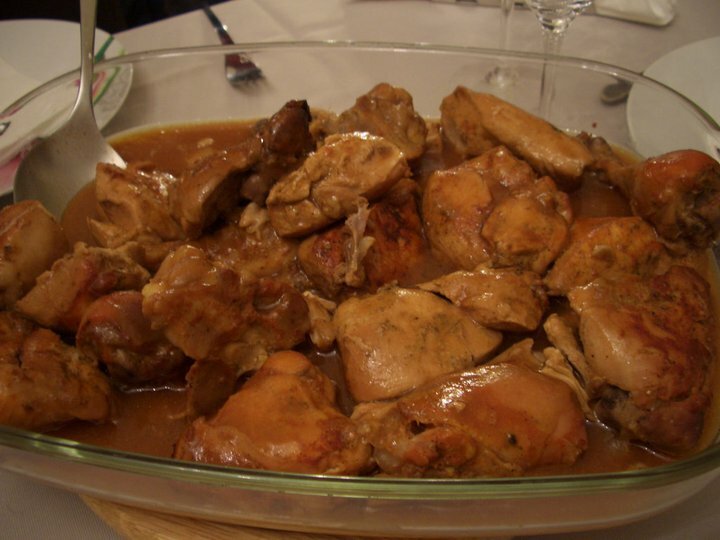 They also prepared a very good meal with Mediterranean dishes and the strong flavors of the wine matched the food well. The bottle finished pretty quickly – I guess this is the characteristic of any good wine- so Dan, our host, offered to open another bottle. 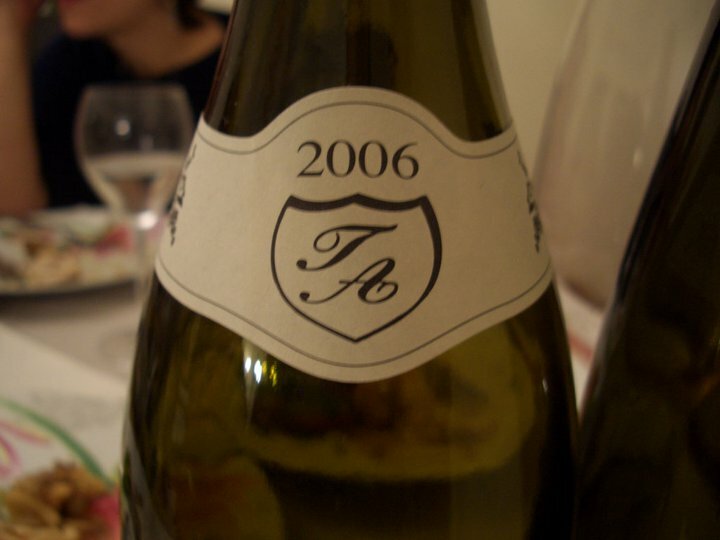 It happened that he opened a bottle of 2006 Novac from Stirbey that I offered him as a gift a few months ago. This was another bottle that rested in my cellar for about 2-3 years as well. The style of the Novac was on the lighter side, but it was really welcoming. This is an easy going wine especially after the concentrated South African blend. There was however a slight touch of cork taint in the Novac. I was taken by surprise by this wine and I can certainly say that the Novac has better drink-ability compared to the 1st wine, even though the aromas and flavors are not as intense. The bottom line is that the Novac came as a breath of fresh air. 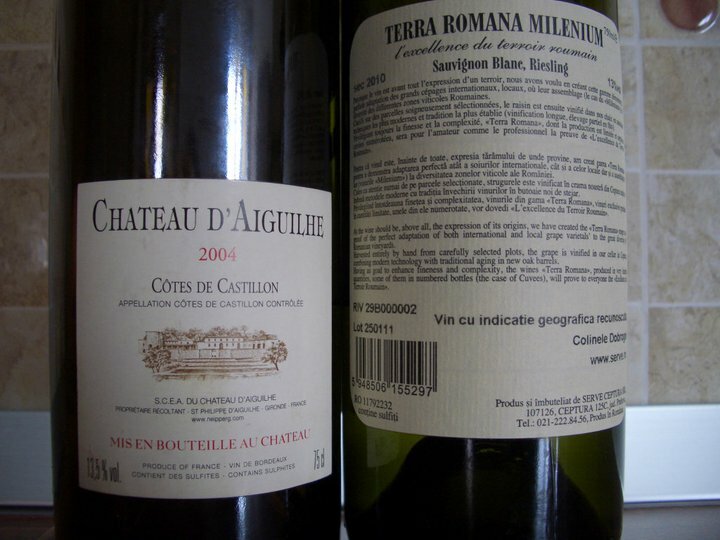 It is nevertheless a less commercial style and more of an Old world wine. The night finished fairly late for a regular MON. I still contemplate if I should visit Mega Image again tonight or not for what I forgot to buy yesterday. You never know how the evening may change. Mr Alfred Binder organizes courses about wine and I was invited, last THU, at the session dedicated to France, to talk about the investment in wine as a guest speaker. You can read more about his courses here. The people attending the course were receptive at the idea of wine as an investment and pertinent questions were raised. 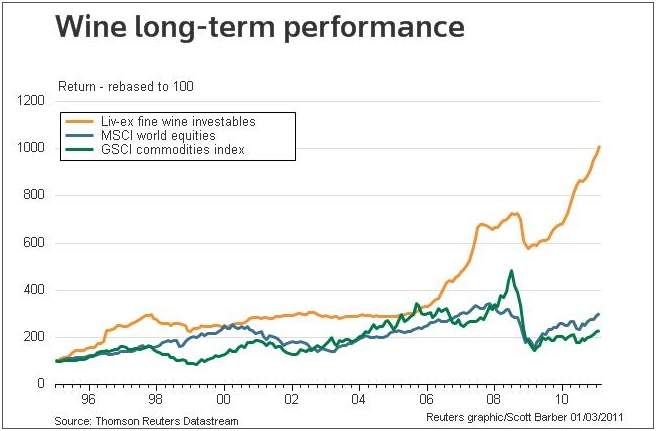 Using charts and comparisons between the performance of different assets including Dow Jones Industrial(DJI), Gold(an example of a passive investment in gold as an Exchange traded fund-ETF), Emerging markets index and Fine wine index(plotted by Liv-ex) for the 2000-2011 interval, one might have a big surprise to find out what were the best two performing sectors. Charts are easy to understand and they say the story better than a million words. 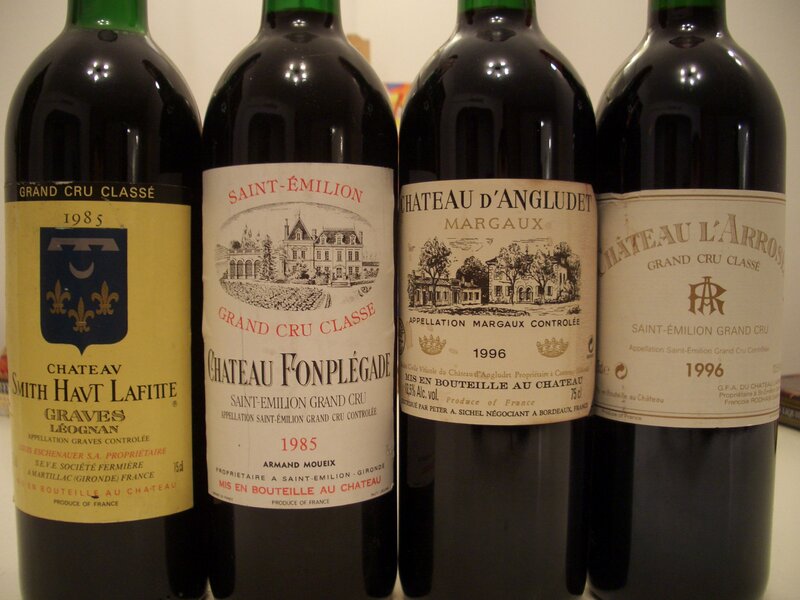 Naturally, like any other asset, investment in Fine wine has its own risks, rules that need to be followed and cautiousness is mandatory. Exponential increase is the best thing that can happen to your investment, but assets cannot go up forever either. Unfortunately, I believe that in Romania this concept is still a bit too revolutionary and time will have to pass until it will be taken seriously. Coming back to wine tasting and the pleasure it can give simply as a drink, I could say that I had some great moments this weekend with fantastic wine. On SAT, with home made food I had a Chardonnay from Pouilly Fuisse accompanied by seared St Jacques, plenty of salads and spinach. 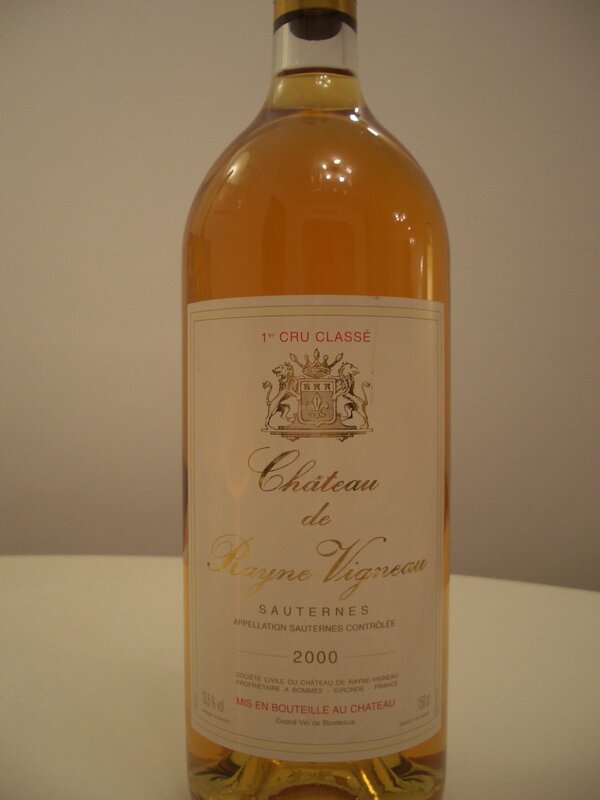 A sweet Sauternes was opened to match the foie gras. 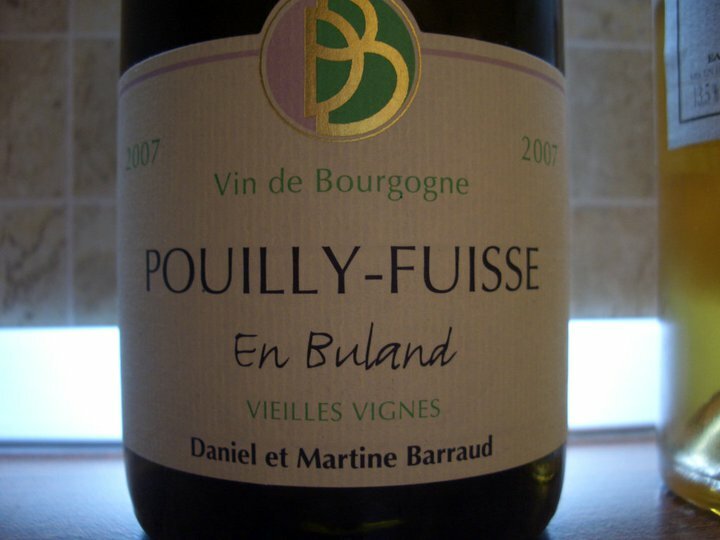 This Pouilly Fuisse went well with the St Jacques and I wanted to do a little experiment and see how it matches the foie gras. That wasn’t a bad combo either. 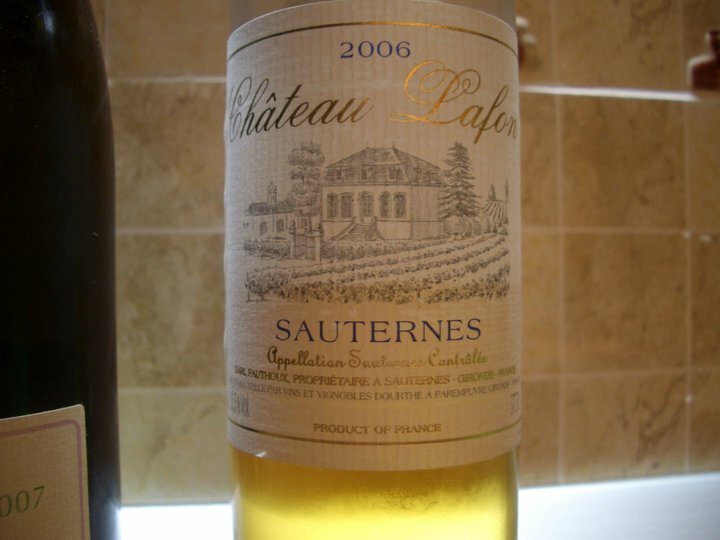 However, both my wife and I liked more the sweet Sauternes with foie gras. I received this wine as a sample from Le Manoir to taste it. Later the same day we visited our good Greek friends, Christiana and Iannis, for an extended home cooked dinner and a game of cards. The meal, as always when cooked by Christiana, was utterly delicious and the only fault I can see is that it is so good that I cannot stop from eating. 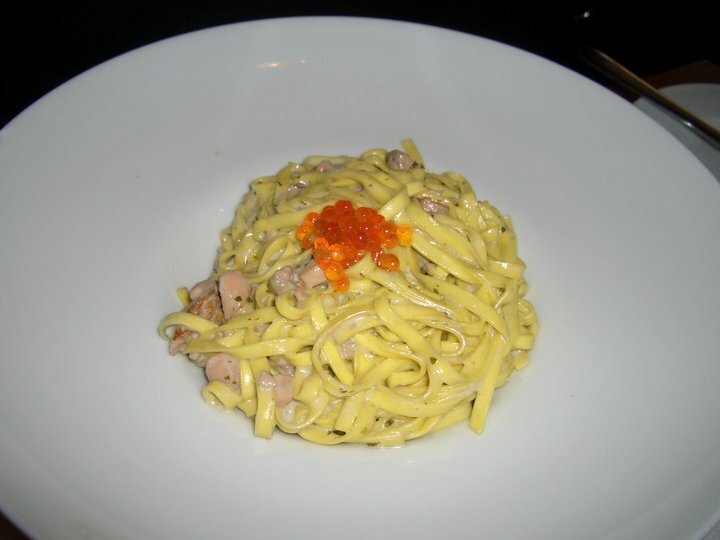 There is something special about every dish, even on the most simple ones, that makes it so delicious. 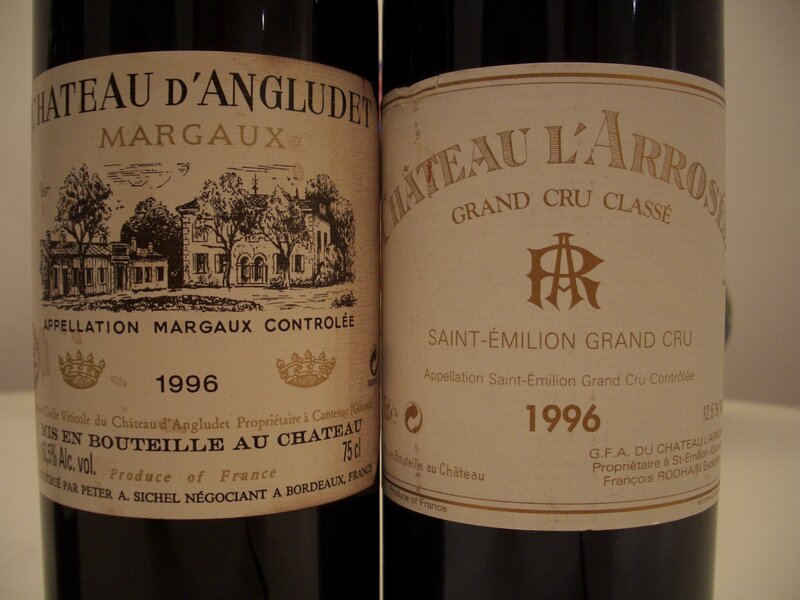 The wines we had were a real treat. 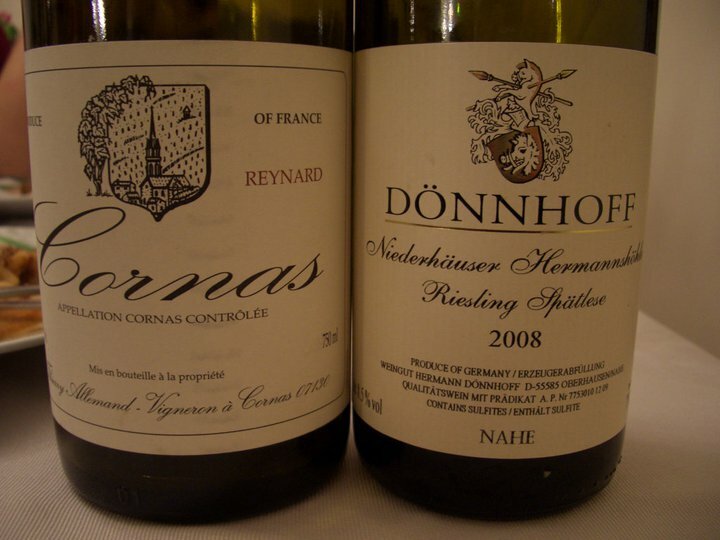 We had a Syrah from the Northern Rhone and a Riesling from Nahe, Germany. For the moment, the wine is quite closed. 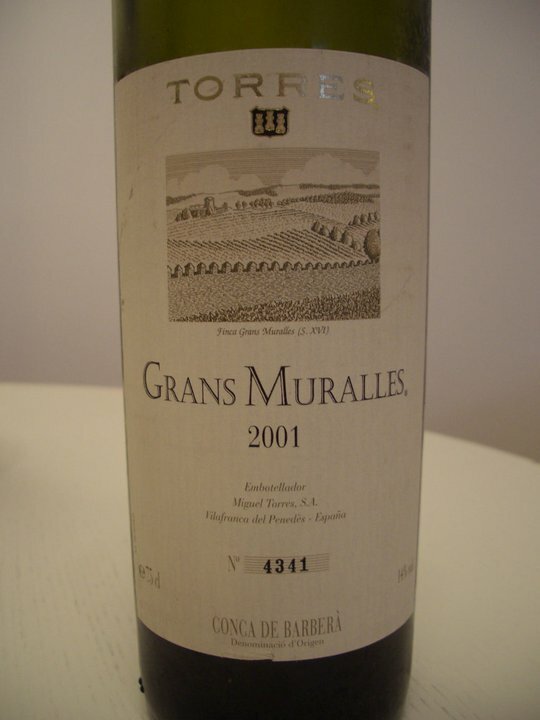 I have no doubts that in 10 years time this wine will build even more complexity and easily reach 97-98 points. Even at this stage the wine is irresistible and the hand wants to reach for the 2nd, the 3rd and the 4th glass from this absolutely balanced wine. It is useless to say that all people enjoyed both wines and together with the food and the good company we had, SAT evening was fun and entertaining. 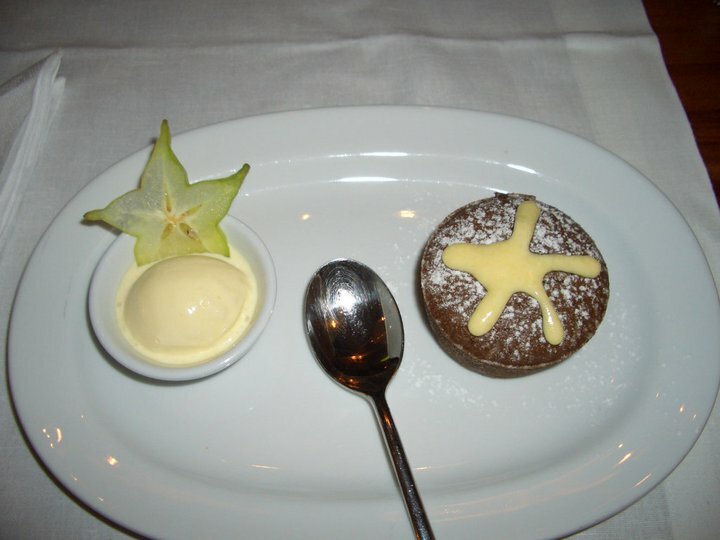 The dessert marked the end of this tasty dinner, but not the evening. 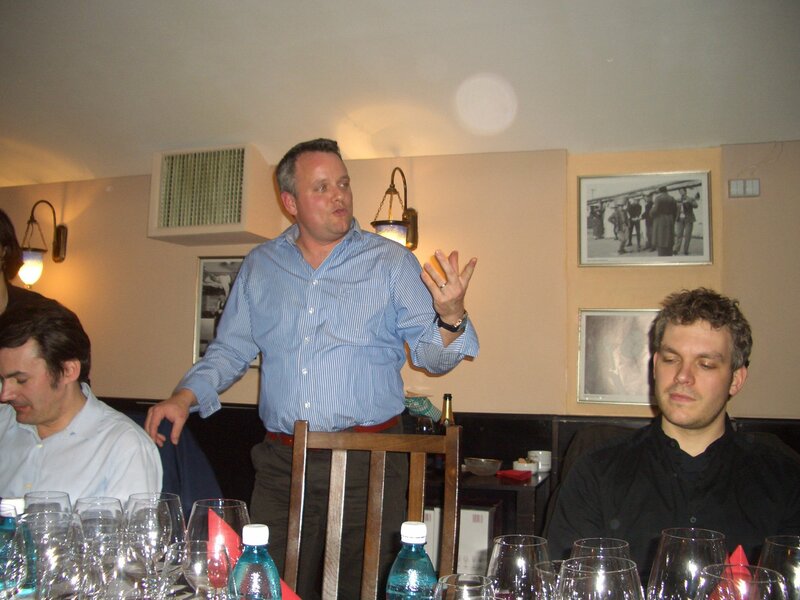 Last SAT, on March 12th, about 14 wine lovers, some accompanied by their wives or girlfriends, got together at restaurant Trattoria Roma Opera for the 1st edition of the International wine round table for 2011 in Bucharest. The event started at 18:00 and while there were still a few people to come, all guests had the chance to taste the sparkling from Stirbey while the introductions were made. The event brought together two winemakers: Oliver Bauer and Ghislain Moritz, seven wine bloggers and the rest of the attendants simply wine lovers. 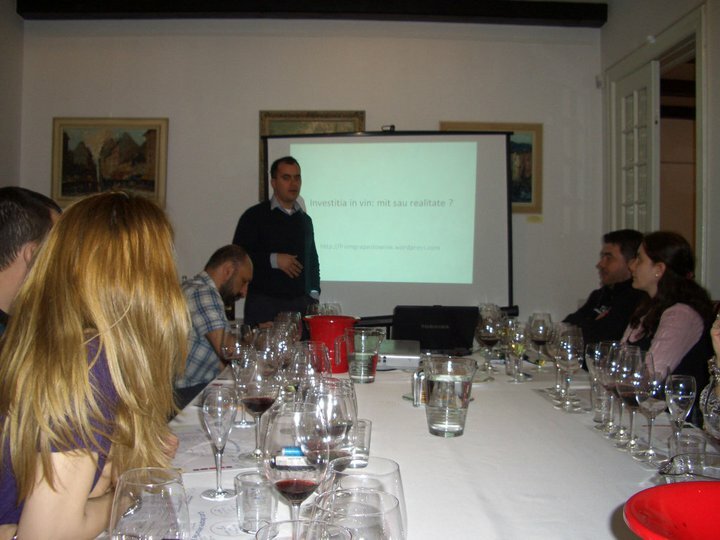 The wine bloggers that attended this gathering were: Ciprian, Sorin, Mihnea, Nicusor, Raluca and Oliver and myself. The atmosphere was warm and friendly and everybody excited in the expectation of the actual tasting. Together with Oliver, I started to uncork the wines and I have to say that three bottles were a bit of a challenge to get the cork out in one piece. Oliver pulled the cork on the 1970 Magnum and as the cork was completely soaked it just did not want to come out in one piece. 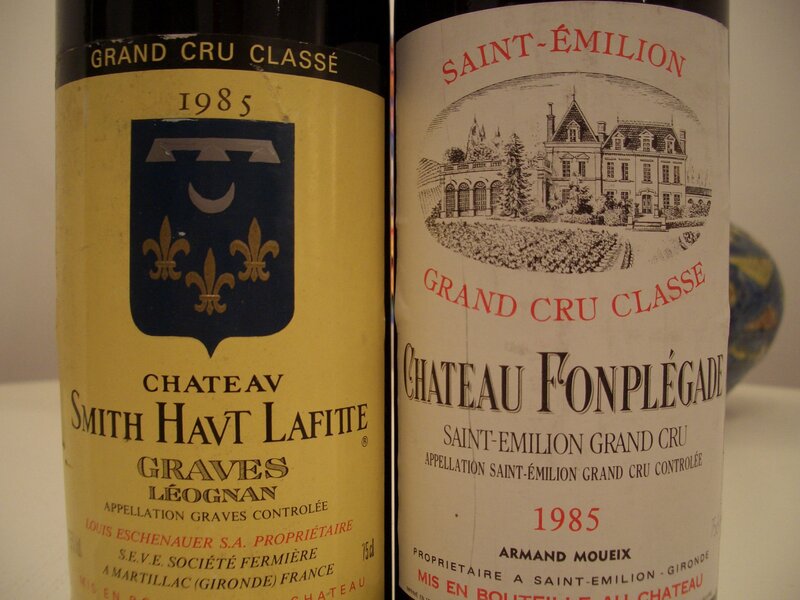 I experienced the same challenges with the 1985 Smith Haut Lafitte and the 1996 d’Angludet. Both corks were soaked and just broke into two pieces. I managed to get the 2nd remaining part of the cork from the Smith Haut Lafitte clean and smooth but not in the case of d’Angludet. All the wines were put in decanters while we had the first 2 flights with Champagne and Riesling. Oliver was a great host and told the story of each wine before being poured in glasses. His explanations were right on point, informative and easy to follow even for beginners. We started the tasting with the flight of Champagnes and they were served in the exact order of my tasting notes. 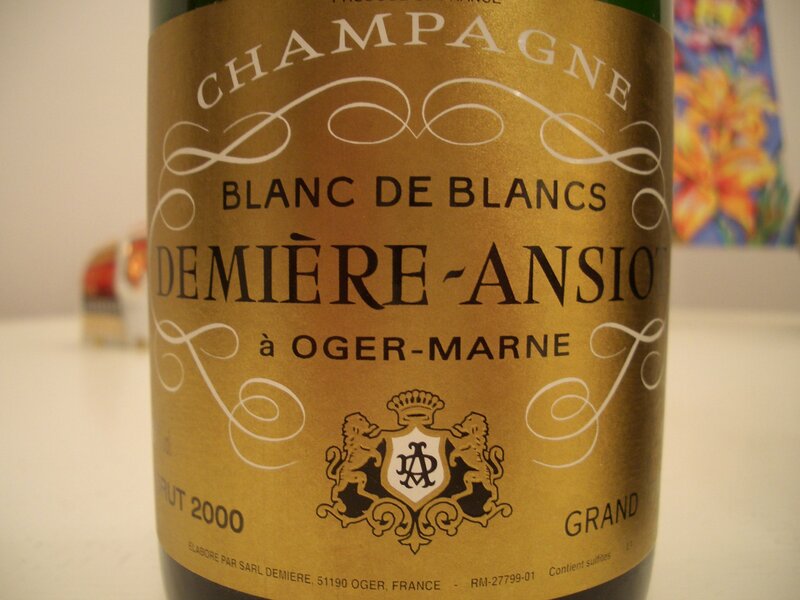 A Champagne made from Grand Cru vineyards from le Mesnil sur Oger. This producer makes only 3 wines from 2.5 ha and this is a 100% Chardonnay sparkling. The group rating was 1. 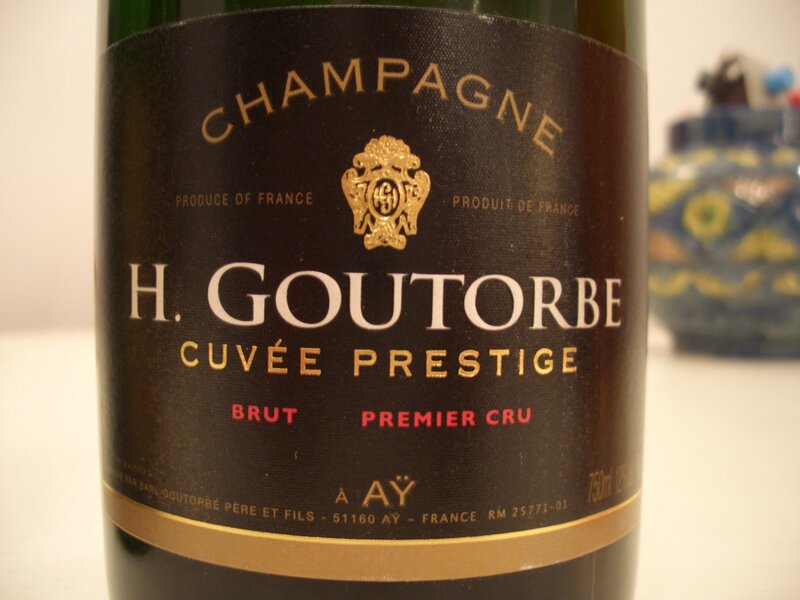 2000 Demiere Ansiot 2. both Loriot-Pagel NV and H. Goutorbe Cuvee Prestige 1er Cru NV with the same number of votes. 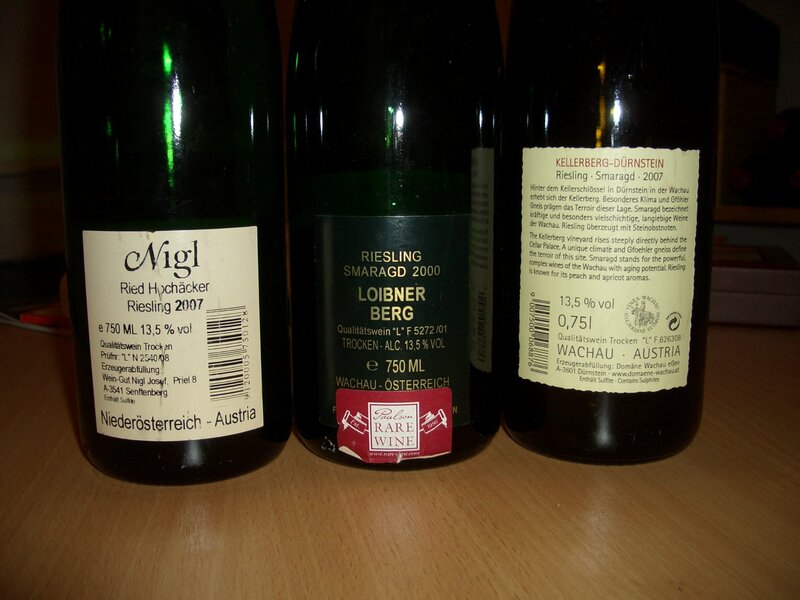 Next flight was Riesling from Austria. With this wine we started our Bordeaux wine tasting, the actual purpose of our event. 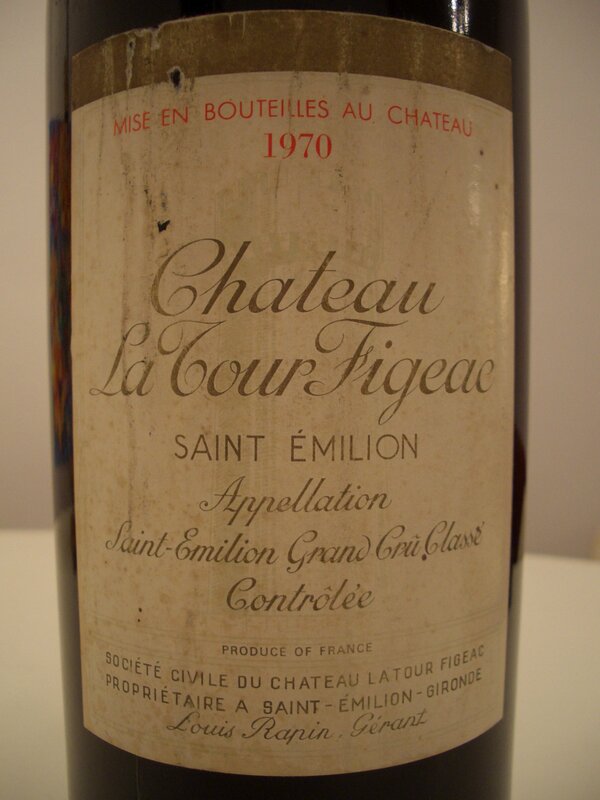 The wine of the night for me this 1970 La Tour Figeac. Unfortunately this wine was cooked, on the nose and the taste the wine was maderized. Not rated. Once the thematic tasting was over, Oliver and Raluca prepared two of their whites: a 2006 Feteasca Regala Genius Loci and a 2008 Sauvignon Blanc Vitis Vetus for the ones still in need for some more wine. 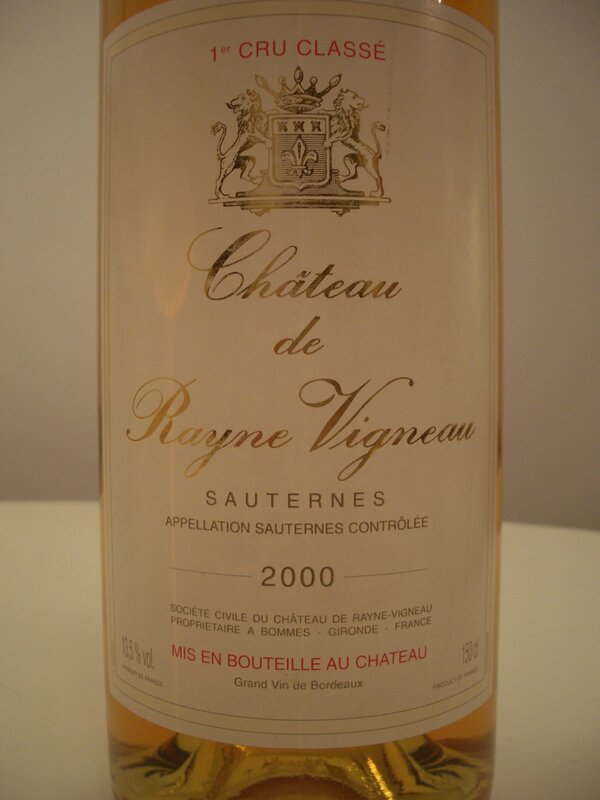 I found it impossible to have any more dry wine after the sweet Sauternes. The atmosphere during the wine tasting was relaxed, but also spiced with pertinent discussions about each wine. I am certainly looking forward for the next gathering. To see more pictures from this event you can go here and here. On SAT, March 12th, a new serie of wine related events begins in Bucharest. This is an initiative started a few years ago by the team behind the blog Cellartales that already organized several dinners in other cities outside Bucharest (Sibiu and Dragasani area so far). The aim of this initiative is to bring together wine lovers and organize thematic wine dinners. Now this move starts in Bucharest as well, assisted by From grapes to wine, and the objective is to have such an event organized every 5-6 weeks. The theme of these wine dinners will be announced in advance and suggestions will be accepted as well. The group of participants will not exceed 14 people. 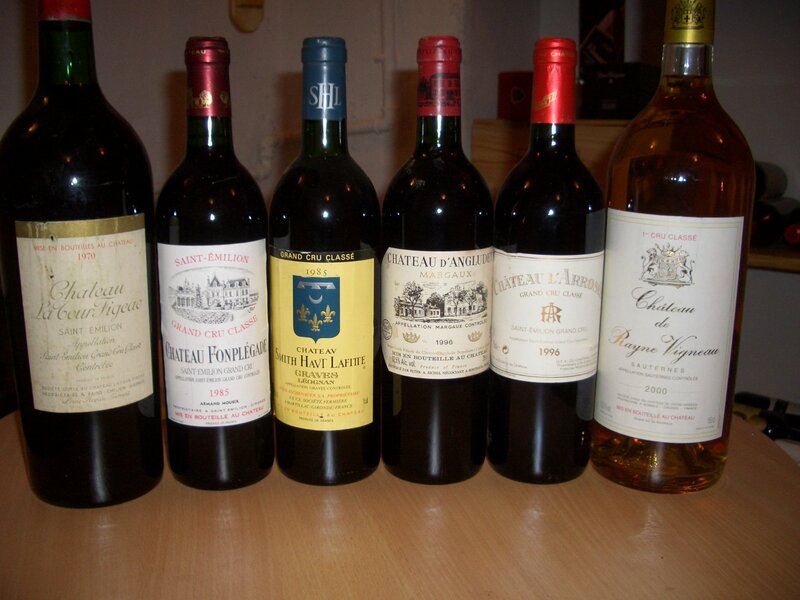 Our first event will take place tomorrow and is dedicated to old vintages of Bordeaux. The seats for this event were occupied within 3 days from spreading the word so any prior advertising was no longer necessary. The cost per seat for this event was 175 Ron and includes tasting of all the wines, water and a plate with cheese, grilled vegetables and some charcuterie products. For anyone interested to attend the next similar event, please send an email with your details to my address: cosmin.grozea@gmail.com or to raluca.bauer@cellartales.com . The seats will always be limited to 14 people and the cost per seat will be around 35-40 Eur per person. If there is interest to try higher end wines this cost may increase. Will come back with tasting notes and feedback about the event after the weekend. Meanwhile, close up pictures with the wines of this event could be watched here. As we are slowly approaching the Good wine fair, this week was above average in terms of wine consumption for me. Whether it is a coincidence or not, I do not know. I only know that the right circumstances occurred. For some wines I failed to put down complete tasting notes, but here they are anyway. 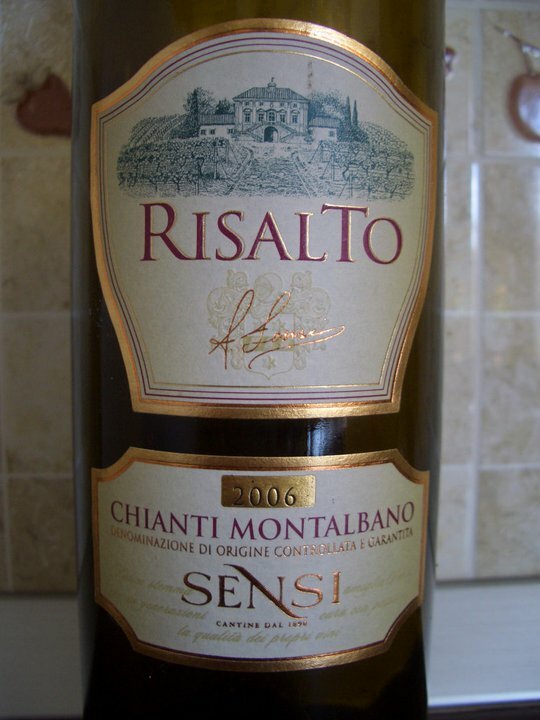 I started on MON with a wine from Tenerife, Spain that I purchased a few years ago and a 2006 Italian Chianti Classico. This was a very mediocre wine. I did not like it at all and forced myself to have several sips eagerly trying to find some positive things about it. Unfortunately I could not. The wine went down the drain. 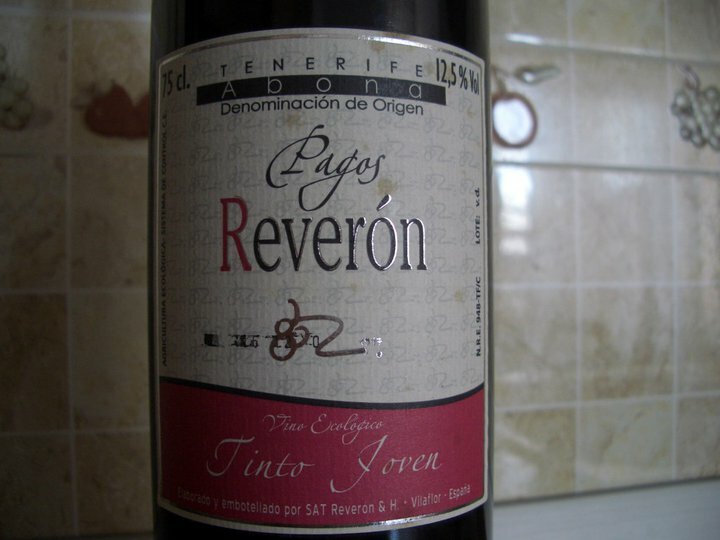 It is a real pity as I actually bought this wine directly from the property when I was there. I opened the next bottle of wine, received as a gift, hoping for a more pleasant experience this time. On TUE, on March 8th, to celebrate Woman’s day, I had dinner with family in a more extended version at home and had two wines. 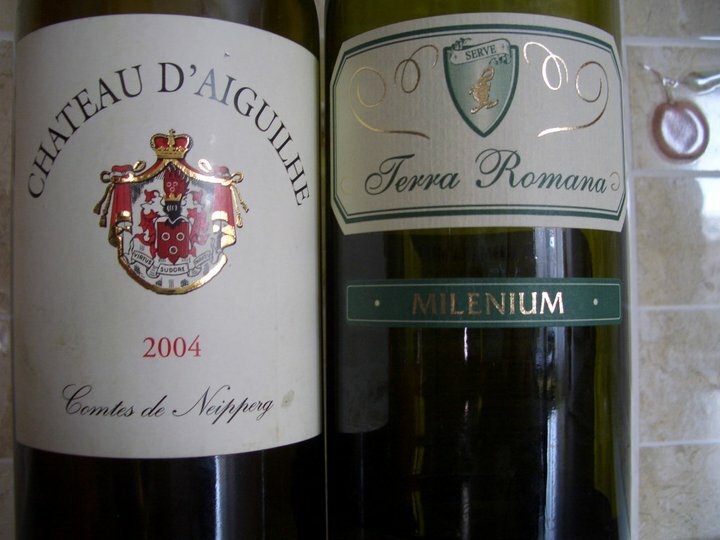 A white received from Serve and a red Bordeaux. 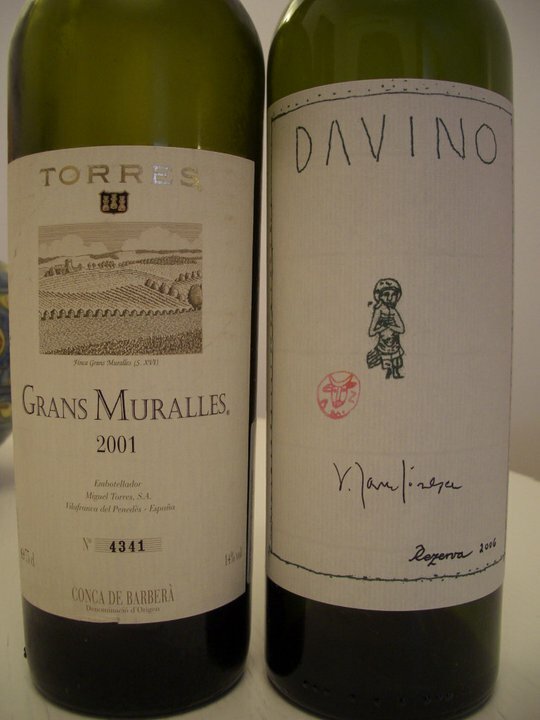 – the grapes come from newly planted vineyards with yields of 8 tones/ha. 15% of the wine was aged in new oak for 3 months. I already had a bottle of this wine a few weeks ago and you can read full tasting notes here. 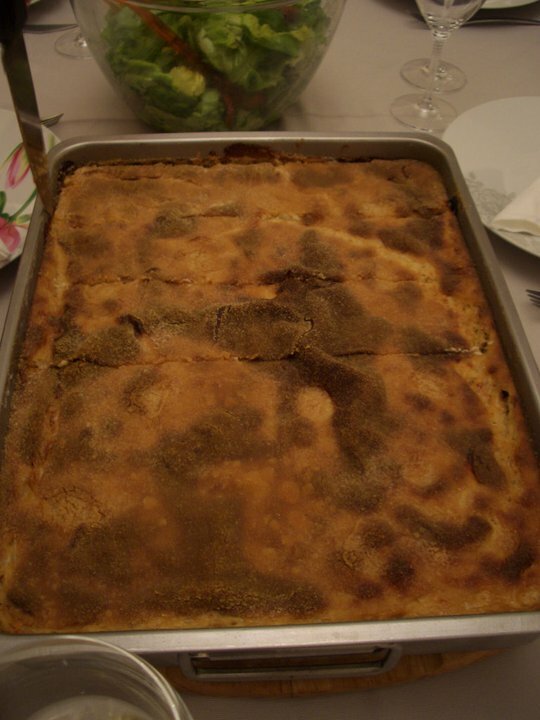 On WED evening we had dinner with friends and brought Lebanese food at their place. 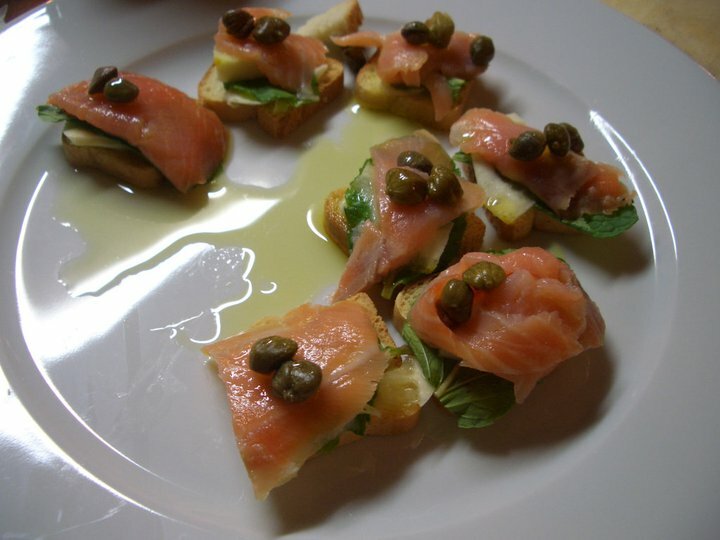 For appetizer we quickly prepared some finger food with smoked salmon, fresh mint, capers and lemon to go with the bottle of sparkling. 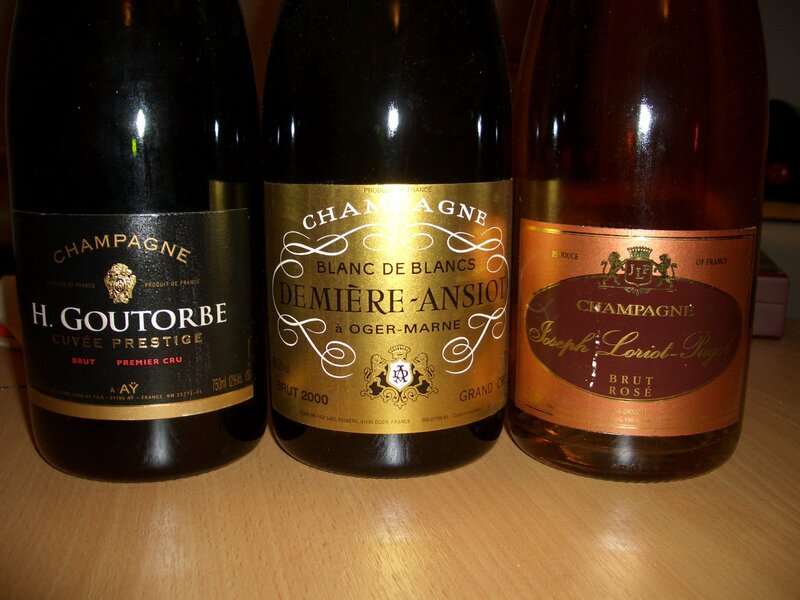 As I am still in the mood for bubbles, I brought a bottle of the sparkling I bought recently from Stirbey. Our dinner partners liked the wine and the pairing with salmon. For Lebanese I brought a 2010 Cono Sur Gewurtztraminer that I think went fairly well. The intense flavors of litchi and rose petals were a fairly good match for the richly aromatic Lebanese food. I think this Gewurtz is a crowd pleaser as everybody like it and they all asked me where can they find some. It is nice to surprise people with good wine. Usually this is how all passions start: with a spark. Last weekend was only about Romanian wine and to my surprise, now reviewing the tasting notes I took, all wines were from Stirbey. Ain’t that something ? Looking back, the reason why it was only Stirbey, is the fact that I liked these wines at the Vinul.ro’s fair last week and I wanted to try some of them again quietly, at home. On SAT, after a rush for some mandatory gift buying for my wife’s birthday, we arrived at home at noon, exhausted, with an unsuccessful shopping result and completely starving. 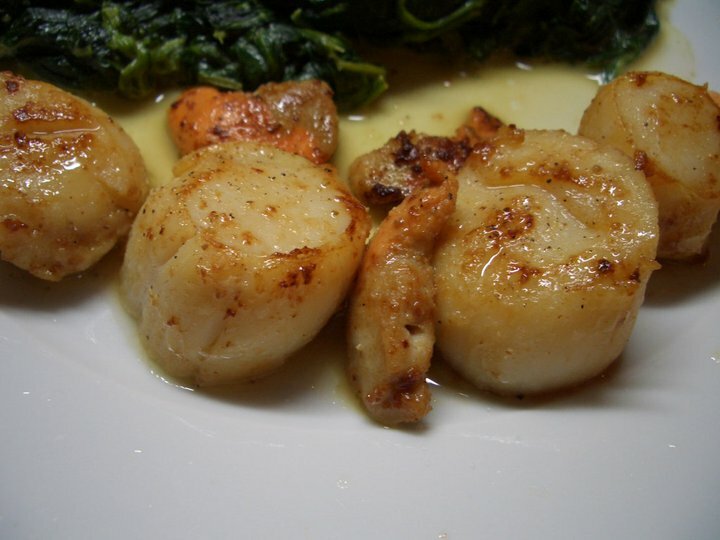 So we did some home cooking with fish and St Jacques we still had in the freezer. 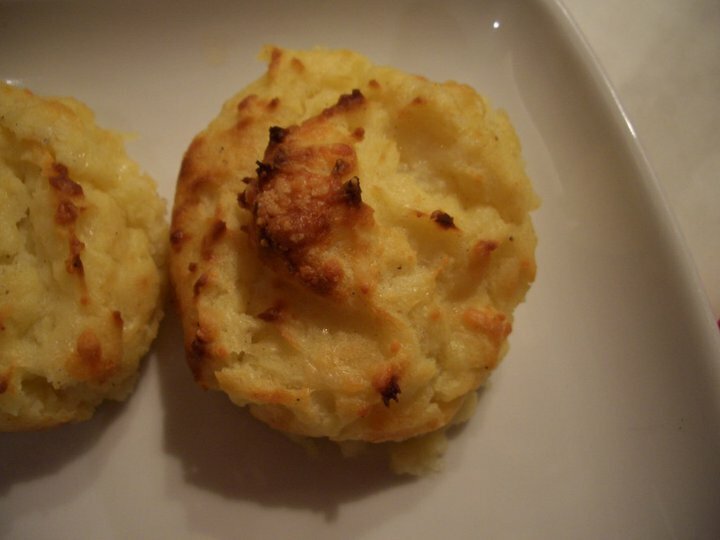 The menu was simple, it took only 20 minutes to prepare, but the result was excellent. 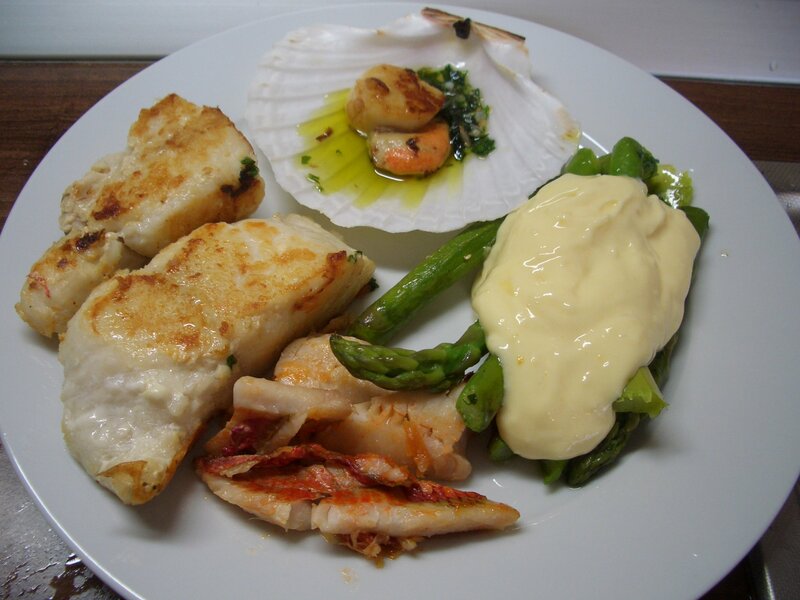 Two types of grilled fish, butter roasted St Jacques, asparagus and freshly home made Mayo. I have to give credit to Andreea for the home made Mayo as it was entirely her work. 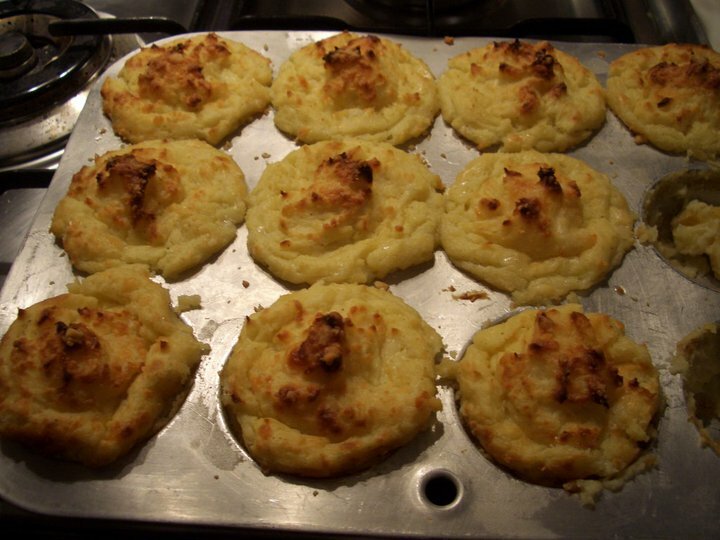 Such an easy to prepare and tasty dish. I opened a Sauvignon Blanc Vitis Vetus 2008 from Stirbey that I received as a free sample from the winery. The wine complimented the dish nicely and happily balanced the fat of the Mayo. On SUN was my wife’s birthday and we started lunch by having a light appetizer at home together with a sparkling also from Stirbey that I purchased recently. For appetizer we had some finger food made from small French toast, smoked salmon, thinly cut lemon, fresh mint leaves, capers and butter. Together with the sparkling, this was one of the best pairings I had so far. The sparkling from Stirbey is bone dry, fresh and mineral, with rich and smooth bubbles, aromas of citric fruits, chalk and dough, very pleasant mouth-feel, the acidity is not aggressive at all, the finish is medium and mineral. 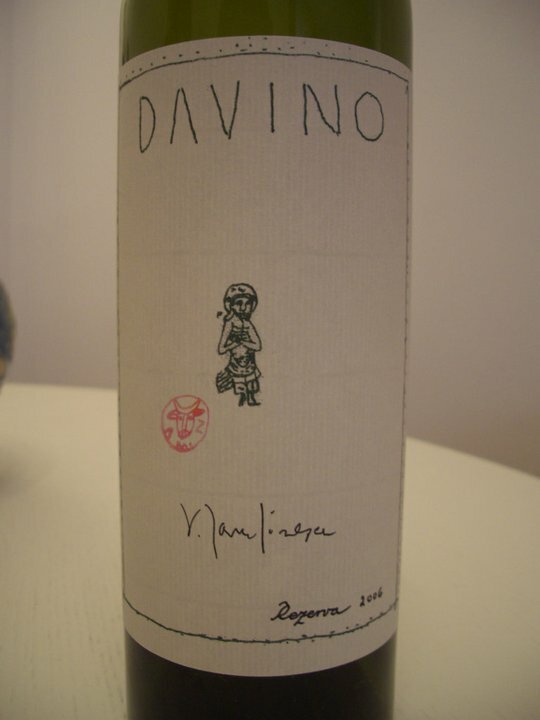 Such a lovely wine that you could easily drink a couple of bottles with food. 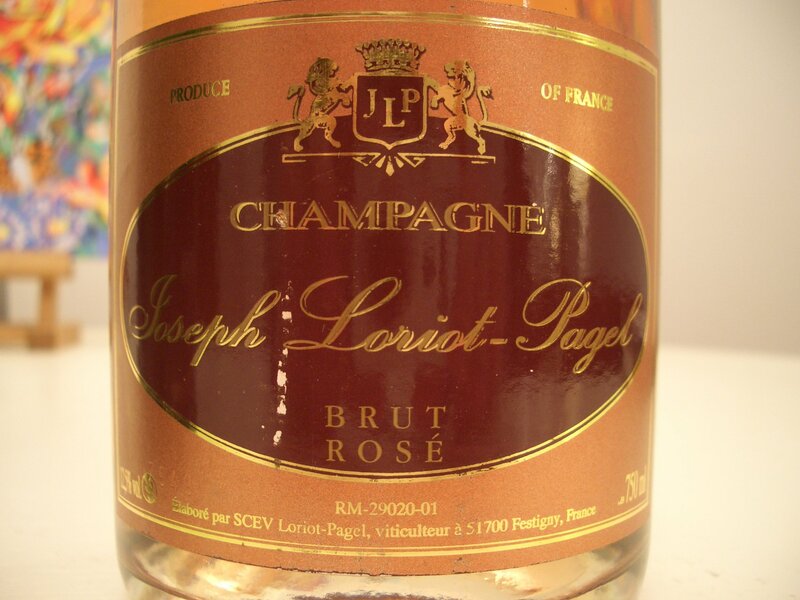 However be aware: if you are not a fan of extra brut sparkling, this wine may not be for you. Between four people this bottle was finished in about 15 minutes. Once appetizers and the sparkling were done, we left home and went to a restaurant to have lunch and continue our small party. 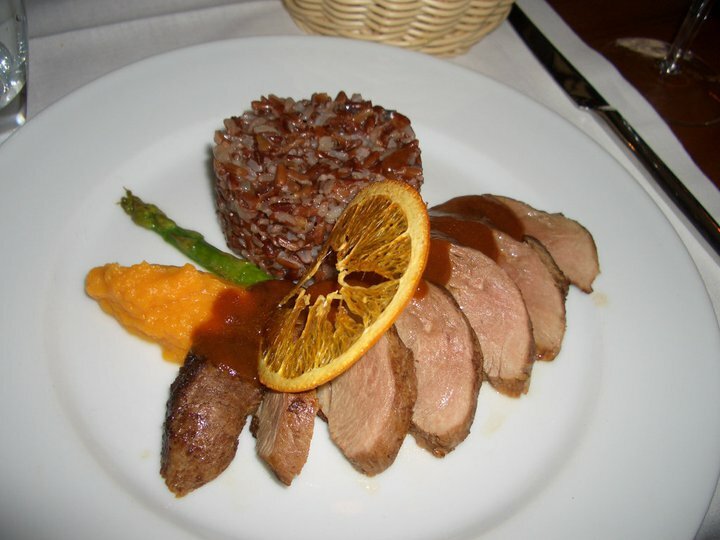 We chose La Bonne Bouche, a restaurant with French cuisine located in the Old Center. The location is very nice and gives you a feeling of warmth and coziness. 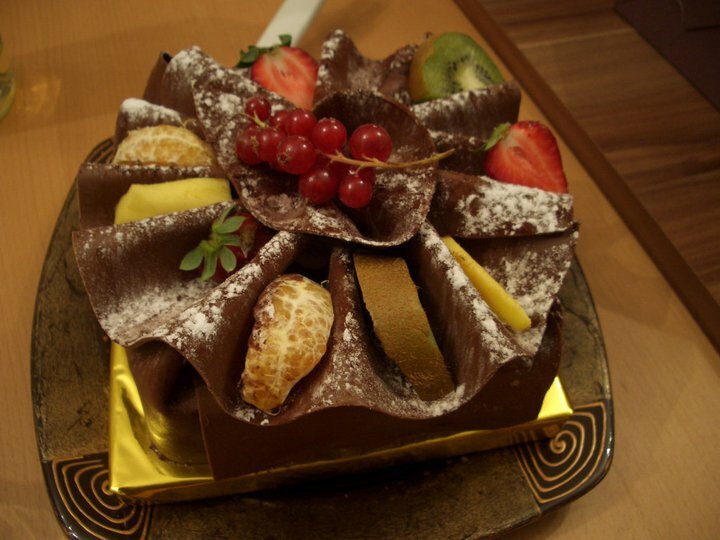 The food is overall good and the dishes have a nice design. 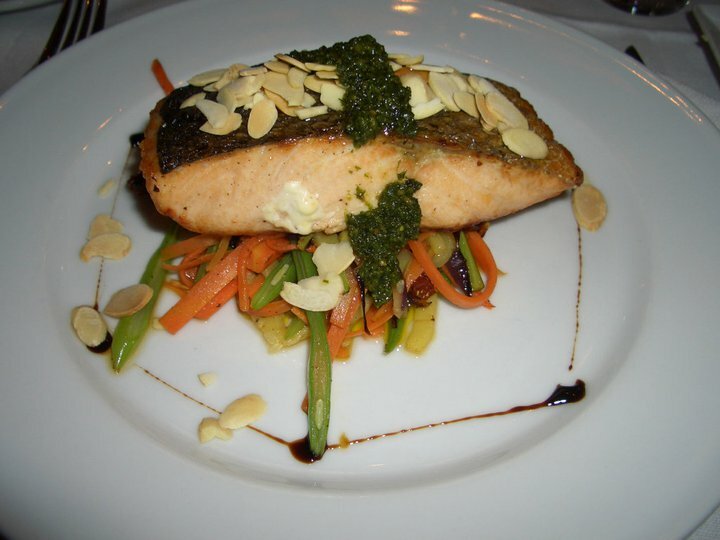 We tried the duck breast with sweet potatoes and asparagus, Salmon with vegetables, Pesto sauce and almonds, freshly made pasta with Salmon and a small dessert. 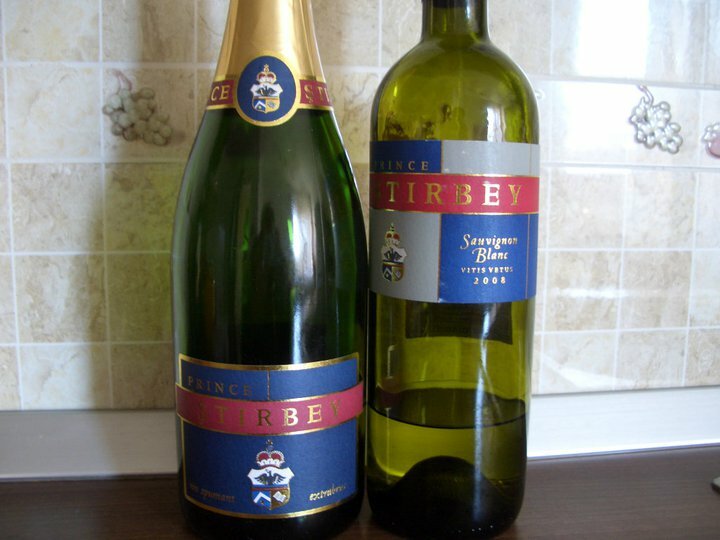 As the sparkling we just had at home was made from Cramposie, I suggested to try the still version of the same grape variety, also from Stirbey, they had on the menu. So our choice was a 2009 Stirbey Cramposie Selectionata. The wine has nice aromatics, a pleasant acidity and my favorite part: the finish. There is a beautiful, clean, fresh flavor of pink grapefruit in the aftertaste. Unfortunately there is not a single bottle left available at the winery, as their entire production of 2009 whites is sold out. I guess we just have to be patient and wait the release of the new 2010s. After the SAT shopping rush that culminated successfully the same evening with a second trip to the stores, SUN was a relaxing and fun day spent together with the family, with good food and interesting wines.